The type of cask used to mature whisky is clearly a vital part of that spirit’s final flavour in the glass, whether that cask used to hold Sherry, Bourbon, Port or Madeira. But what about location? Does it make any difference if a whisky is aged in a wave-beaten maritime warehouse, rather than a vast bond in Scotland’s Central Belt? Tom Bruce-Gardyne reports. Coastal influence? 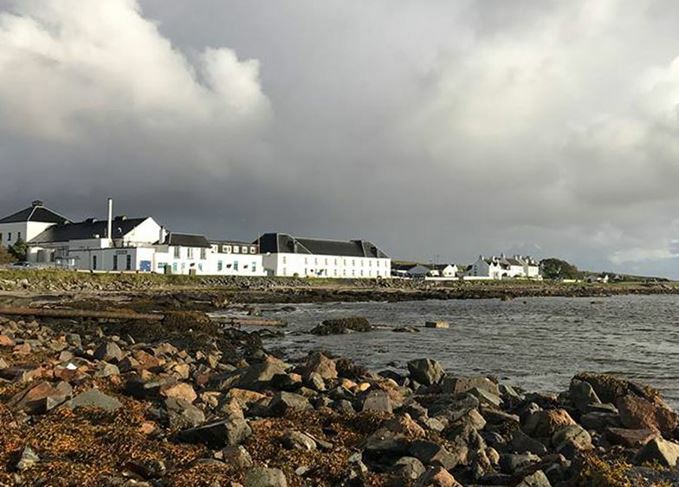 : Bruichladdich matures its whisky on Islay, but does location make a difference? When it comes to maturation, Scotland’s whisky makers have their heads stuck in a barrel as they obsess about its previous contents – be it Bourbon, Port, Sherry or Sauternes. But does the location of those casks matter – or is that irrelevant? Before the complimentary dram and invitation to browse the distillery shop, most whisky tours will offer visitors a glimpse of a warehouse; the guide will invariably mention the angels’ share and probably say a few words on the importance of maturation. Peering into the silent gloom, people may be sceptical about the idea that the real magic happens in the cask, and most will probably get back on the bus believing that all the whisky is matured on-site. In reality, much of the spirit produced at Scotland’s whisky distilleries is taken by tanker to be filled into cask in vast central warehouses such as Diageo’s Blackgrange bond near Alloa, which alone holds about six million casks. This arrangement makes life much easier if you are a blender, and it is certainly more efficient and cost-effective. But does it have any influence on the character of the whisky? Well, as with so many debates, it depends upon whom you ask: does it really matter where whisky is matured? ‘I guess it depends what you are producing. If you are one of the larger brands, where consistency is important, then the marriage of many different casks for a bottling will most likely mask most of the effect of the distillery’s location. Added to that, with maturation warehouses often in different locations, then where it’s matured becomes less relevant. ‘In our case, being the first (legal) distillery on the island, we are seeking to make the most of the locality to find out what the “elemental” climate of Harris will do for our maturing spirit. In time, we’d like the Outer Hebrides to become a new whisky region of Scotland. ‘The science is very clear: the three processes which influence maturation are additive diffusion, reductive evaporation and chemical reaction (in case you needed reminding). ‘The rate at which these processes occur changes both the concentration and the ratios of congeners in the spirit, and therefore changes the quality of the maturing spirit. All three rates are influenced by the local weather and atmosphere, particularly the temperature and relative humidity. ‘In this way, the local Harris conditions have a direct effect on the maturing spirit. Otherwise put, it does rain a little in Harris, and summer is only slightly warmer than winter – and these two factors will both have a positive effect on the extraction of flavours from the cask. ‘Take the same cask to Speyside, where there is much lower humidity and higher temperature variation, both over the course of a day and from season to season, and you will create a different whisky. ‘The Hearach Isle of Harris single malt should be the embodiment of the island and its people as far as possible. Provenance is therefore very important to us. We will only allow our spirit to leave this island when it has been distilled, matured and bottled here. ‘You don’t have to walk far in Glasgow, Leith or Aberdeen to be reminded of Scotch whisky’s historic importance to these cities. Huge bonded warehouses, many converted into luxury flats and offices, are testament to the scale of the industry, and to the fact that it has never been possible to store all Scotland’s whisky in its numerous, remote and often small distilleries. ‘In Diageo we are currently maturing over nine million casks across three dedicated warehouse sites. Regardless of their specific location, whether by the sea on the west coast, by the sea at Leven, or a few dozen miles from the Firth of Forth – all three share Scotland’s maritime climate. ‘After years of research, we believe the exact site of a maturation warehouse makes no discernible difference to the whisky. Scotland’s marine microclimate is pretty consistent from coast to hill to glen, such that any small climatic difference is not meaningful over the life of a maturing whisky. ‘The unrivalled multiplicity of flavours and character in Scotch derives partly from raw materials – particularly any phenolic character from malted barley – from the process of fermentation and distillation, and above all from maturation. ‘The size of cask, the species of wood, its previous contents, the number of times it has been used to mature whisky, besides the length of time in wood, all play a significant part in determining the spirit’s final character. ‘Romantics might cling to the notion that maturation at distilleries imparts some special flavour or character to the maturing whisky, but the facts say otherwise, and, as those once noble whisky bonds demonstrate, whiskies have been matured in central locations for generations. ‘For that matter, in reality romantics would baulk at the idea that even a relatively small distillery like Lagavulin might attempt to mature all its annual production of around three million litres in its heart-achingly beautiful little bay on Islay. The physical footprint required would leave an indelible scar on the landscape, which even the most artfully planted trees couldn’t conceal. ‘Traditionalists may have glossed over the truth of maturation, believing it always happened at the distilleries. However, our forebears were smart. They could see the sense in bringing the casks to locations that were easier to access and had the same impact on the whisky held within them. If you pan back on Google Earth, Scotland shrinks to a tiny jagged fist on the eastern edge of the Atlantic. You would imagine the climate is much the same everywhere, yet for those who live here it can vary dramatically from coast to coast. Even when the television weather forecast puts the entire country under a black cloud with two drops (which is not uncommon), the rain that falls tends to be softer in the west and harsher in the east. Nick Morgan says that ‘Scotland’s marine microclimate is pretty consistent’, but if he spent six months on Harris, followed by six months in Alloa, he might change his mind. On the other hand, there’s a lot of romantic hogwash talked of storm-tossed distilleries and their whisky casks breathing in the salty sea air. As a compound, salt has never been found in any single malt. And in terms of aesthetics, as Morgan suggests, it would be unthinkable to cover Islay with enough warehouses to mature all its whisky.